Shackpalace Rituals has grown out of a collective family vision to continually question the way we live in our homes, so that we can live better. After spending a few years freelancing in graphic design, I joined the family business, working in my dads building design company; Frank Macchia Design Studio. Led by dad’s creativity and ongoing commitment to self growth, our family all began to question many aspects of our lifestyles with a focus on the way the spaces we live in and the products we use daily impact on our lives. This led us to create Shackpalace, which began as a philosophy for a new type of home, one that is kinder to the earth and rethinks convention to promote a simpler, more ritualistic lifestyle. As an exploration of our ideas for this new home concept, we built our first Shackpalace guest home in Noosa, which was designed by dad while my mum and I sourced beautiful things to fill the home with. 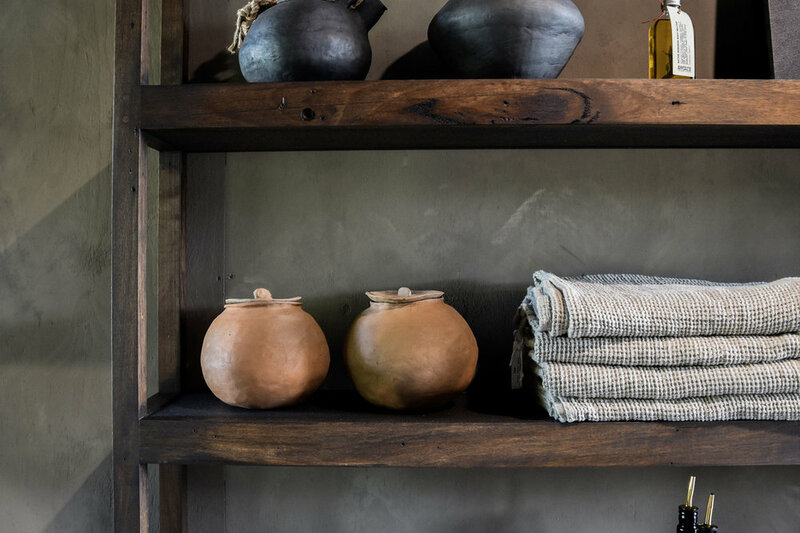 In our search for objects that slow us down and inspire daily rituals, we found that handcrafted items, especially those made with ethical practices and natural materials (just as the house itself was built) evoke a deeper connection, and bring us into the present more easily as we use them. We began working with many talented artisans locally and globally to create pieces that enhance the guest experience in the home. From the desire to offer these creations to a wider audience, Shackpalace Rituals was born in late 2017. We now sell our curation of beautiful, ethical products on our online store (www.shackpalacerituals.com) and in our Byron Bay store located in the Habitat precinct (Shop 8, 1 Porter Street, Byron Bay). As the philosophy of both Shackpalace (run by dad, Frank Macchia) and Shackpalace Rituals (run by me) is to continually question the homes we live in and the products, ingredients and objects we use, we will never stop evolving, and growing personally, as a family and as a business. I am inspired by the powerful creative energy I am surrounded by in this community, as well as all of the incredibly talented artisans and designers who I am lucky enough to work with. My own daily rituals help me to slow my mind and get into a creative flow. We want to contribute to the creation of a world where we are all empowered as individuals. There is a disturbing trend in today’s society where large corporations, including government are increasingly creating systems that enslave & control us, resulting in a population of disempowered, stressed and often unwell people. We want to encourage an ongoing commitment to self experimentation and growth. To heal the world, we must first free ourselves. Beauty is a feeling that we get from connecting with something or someone deeply. It is within all of us.